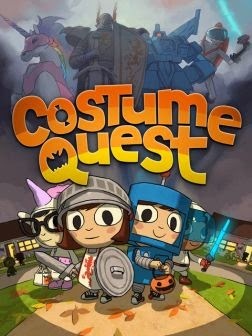 Costume Quest is a role playing game by Double Fine that where children's costumes become the characters that they are pretending to be, allowing the kids to fight epic battles against monsters. The group leader's sibling is taken by a monster from another realm called Repugia, when mistaken for a candy corn. A trio of kids must travel across their neighborhood to fight the Repugnians to get their friend back. It was released for PSN on PS3 on October 19, 2010, on XBLA for Xbox 360 on October 20, 2010, for PC on October 15, 2011, for Mac and Linux on May 7, 2013, and for iOS on October 10, 2013. The kids go through the portal to the monster world of Repugia to save their friend Lucy.